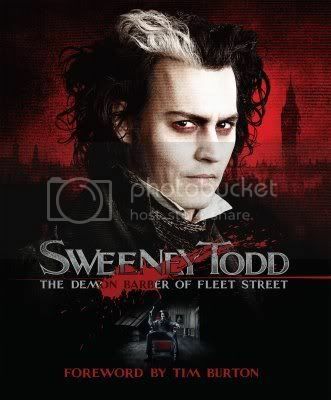 We have had so many great opportunities here at JohnnyDeppReads and last week we were given the chance to ask SWEENEY TOOD author Mark Salisbury a few questions. Keep in mind that Mark attended the SWEENEY TODD premiere last week and also moderated the SWEENEY TODD press conference the next day, I think we are very blessed that he found the time to visit with us over the weekend. I asked you if you had any questions for Mark and many of you sent in ones that were very similar so I tried to combine those, and I added some myself. I knew that Mark’s time was very limited so I trimmed the numbers down to the questions that I thought would best represent us as his readers. Many thanks to author Mark Salisbury and to Titan books for so kindly arranging this wonderful opportunity for us! JDR: You have quite a long working history with Tim Burton and his projects, I think starting with the original "Burton on Burton" and with the "Planet of the Apes" and also "The Corpse Bride" books. How did your relationship with him come about? MS: I first met Tim back in 1988 at a Beetlejuice/Warner Brothers Christmas party while he was shooting Batman in London and interviewed him for the first time shortly after. I met him again a couple of years later when he was promoting Edward Scissorhands in Rome. Then in 1994 I pitched the idea of doing Burton On Burton to Faber, approached Tim, and he agreed. JDR: Since your books have been non fictional works, including books on comics and comic screenplay writing, would you ever consider writing a screenplay? MS: I finished a script at the end of last year with a friend of mine who writes comic books. We got a lot of positive feedback on it, which has encouraged us to write another one. JDR: What has been your favorite book project? Can you envision yourself doing more books like this about any of Tim's future projects? MS: Burton on Burton was and continues to be the most fun because I get to hang out on Tim’s sets. JDR: Is there a more memorable part about the making of ST and writing this book? MS: My first day on set was when they were shooting part of The Contest between Sacha Baron Cohen’s Pirelli and Sweeney and I broke into a huge grin just watching it on the monitor and hearing the musical playback, and that smile didn’t leave my face throughout the rest of the shoot. You could tell, even then, that Sweeney was going to be something special. JDR: Since you were on set during filming, do you enjoy that part of your research process? How did you decide what ended up in the final book version? MS: I love spending time on film sets, seeing a movie being shot, watching the creation of moments big and small. Martin Amis once called being on a movie set (and I hope I’m remembering this correctly): repetition followed by boredom followed by more repetition. And in a way he’s right, but I still love it. And despite many years of visiting film sets I’m still amazed that a movie ever gets made, such is the small amount of footage shot each day. JDR: How long were you on set? Filming happened earlier this year, ended sometime in May and your book was published a short seven months later. That sounds like a pretty short time frame. Is this the norm for you? MS: I probably spent around two weeks on set in total, maybe more, spread across the shoot. “Making of” books tend to be very last minute, and while there was talk of a book throughout shooting, I didn’t get the go ahead till sometime in August and the book needed to be finished by September in order to meet the printer’s deadline to be in the shops before Christmas. JDR: What was the first step in making this book happen? Did the book turn out as you'd envisioned it when you began it, or did it evolve into something different as you went along? JDR: Do you have any idea what prep work Johnny did for the slashing scenes? Practices on dummies...that sort of thing? MS:I have no idea. But I would think not. JDR: I know that you've written a few books on comics, movie monsters, comic script writing... did you know that Johnny's production company owns the rights to Arvid Nelson's "Rex Mundi" graphic novel series? Any chance that you might be involved in that project? MS: Funnily enough, I’d forgotten they’d bought that. And seeing as I’ve never read it, I’ve just ordered myself a copy from amazon. JDR: What's up next for you? MS: I’m currently in the midst of another script with my friend and there’s the possibility of a book project that I refuse to divulge any details about it in case I jinx it. And our final question to Mark was: Who is the one person you would like to interview or write a book about? MS: I’d have loved to have interviewed Billy Wilder, but sadly didn’t get the chance. Our sincere thanks to Mark Salisbury for his wonderful answers and his time during such a busy period for him!